Try Method Grid - it's free! A key benefit of a Method Grid account is the Method Grid Store – a growing collection of free grids that cover a number of common, repeatable business situations and practice areas. 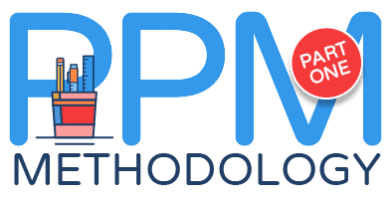 This week sees the introduction of another new resource into the Store – a project and program management (PPM) grid – with phase 1 being the release of the engagement management theme. You can find out more about this project and program management methodology here. This grid will be our most detailed and powerful yet. As such, we plan to build out – and release – the grid in phases; essentially adding one theme of content at a time (version 01 starts with Engagement Management resources). In this blog, we explain a little more about the design principles behind this grid, how to derive the most benefit from it – and – also examine the first iteration (focused on the Engagement Management theme). 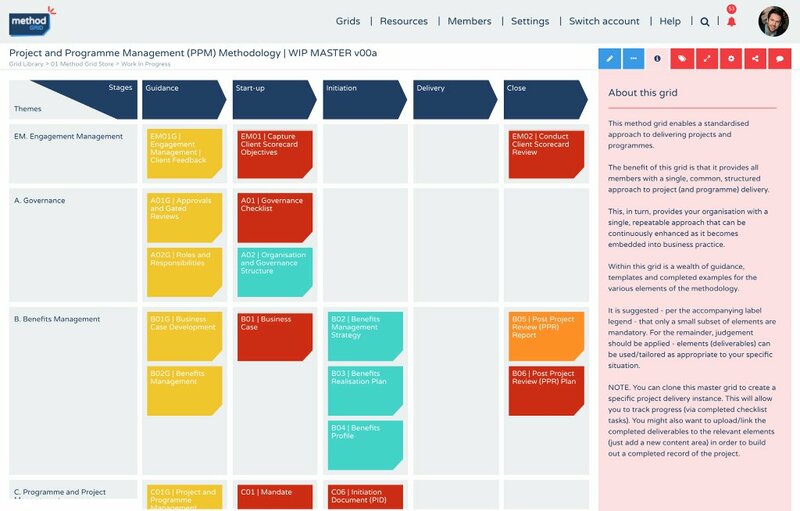 This grid – once complete – will enable Method Grid users to have a standardised approach to delivering projects and programs – providing all members of your account with a single, common, structured approach to project (and program) delivery. This, in turn, provides your organization with a single, repeatable approach that can be adapted to your own circumstances and continuously enhanced as it becomes embedded into your business practice. Within this grid is a wealth of guidance, templates and completed examples for the various elements of the methodology. The accompanying label legend reveals a key design principle inherent in the structure of this resource. This is not about a heavy-handed, bureaucratic, linear process (such methodologies are rarely adopted by busy/experienced/intelligent practitioners). Rather, this grid should be viewed as a deep, structured resource toolbox – that users can intelligently draw from – as contingent on their specific client/project delivery challenge. The labels do provide an illustrative idea as to what a bare-minimum level of compliance might look like – as dependent on project size/risk say but methodology/knowledge managers are encouraged to set such levels at a genuine bare minimum – relying on the professionalism of project/program managers to draw out additional resource as beneficial to their circumstances. The grid is also based on the idea of a simple set of stage control gates – aligned to Prince2 and Managing Successful Programmes (MSP) principles; or, more generically, to the idea that PPM control is best exerted through such governance moments – only allowing projects/programs to progress as critical governance and management detail is developed. This logic is written in the blood of a thousand failures … so such structured, gated methodologies are an important factor in well-led and successful delivery endeavours – especially so if there is inherent delivery ambiguity/complexity to contend with! In this first version, the grid reveals the Engagement Management theme. As described in a previous Climbing Mount Audacity blog regarding client feedback, a client feedback process is relevant to any project/program/engagement management process and, as such, should be deployed as part of your standard approach. Collecting client feedback is especially relevant in the context of service provision to external (third-party) clients. The “client” context is often, however, equally pertinent in an internal perspective i.e. when services are being delivered intra-organization to a colleague recipient. Certainly, the importance of taking (and learning from) client feedback is equally valid in both situations. This first theme contains an example client (balanced) scorecard that can be used to capture client imperative/objectives at the start – and – to review such measures on completion. For organizations that deliver multiple projects, such a discipline (enabling as it does reflective, systematic learning) is an integral component of an overarching quality management system (QMS). Finally, a common application of established Method Grid users should be noted. This PPM grid will allow you to develop your own master methodology. Such a master PPM grid should be the subject of continuous refinement; after every project/program delivery you will want to refine, update and improve the master; for example, by adding new best-practice examples, updating team experts, adding new missing elements etc. The common application I refer to, however, is using such a master reference grid to create specific instances of such grids whenever you enter actual project/program delivery. You do this by simply cloning your master grid into a specific project instance – see here for more on that function. The grid instance can then be refined (tailored to the specific circumstances) and used as an invaluable progress tracking tool. See this blog for more on that powerful functionality. In summary, this grid can serve as the foundation of a deep, valuable resource for your firm. Dom Moorhouse is a co-founder of Method Grid (a platform on which to design, build and share your methodologies and procedures). In his spare time, he CrossFits to stave off middle-age and paraglides temperamentally. All whilst dreaming of becoming a philosophical flâneur.